THE distance between arts and sciences tends to be described as a gulf that needs bridging, and there are an increasing number of projects encouraging (and funding) artists to cross over. The results can be illuminating, if occasionally baffling for the non-scientist; the best provide new ways of seeing the world. This year, the visual art elements at Edinburgh Science Festival focus on the Anthropocene, the word being coined for the current geological age, the age of human impact on the earth. The biggest exhibition, Metamorphosis, at Summerhall – actually three exhibitions involving four artists – is a project by Edinburgh-based art and science collaborators, ASCUS. The contrasting bodies of work show the different ways in which artists work with science, whether by doing science themselves or by using scientific language, imagery and ideas to fuel their own artistic practice. Louise Mackenzie has spent three years working at the Institute of Genetic Medicine at Newcastle University. She has genetically modified the DNA of E.coli bacteria (something of a workhorse in the biotechnology lab) to contain a line of her thought: “What will happen if I store this thought safe within you?” This is explored in objects, films and (if I’ve understood this currently) an interactive sculpture featuring a sample of the E.coli which viewers can alter via the medium of sound. Precisely how all this works is beyond me, but this multi-layered exhibition also plays with a feminist reworking of the Pandora myth. If the genetics lab is the Pandora’s Box of our time, the suggestion is that it contains many possibilities than at first we realised. Upstairs, Edinburgh College of Art-trained fashion designer Aurelie Fontan has been doing science too, developing a fully biodegradable fabric from kombucha tea. Her ‘Tensegrity’ collection plays with the ideas of biodegradability and sustainability, pairing recycled materials with ‘upcycled’ plastic cable ties, an environmental hazard because they will not biodegrade. She posits a future where dresses are grown in labs and can be composted later, presumably when they go out of style. Russell Beard and Stephen Kavanagh, both artists who have spent time in Japan on Lateral Lab’s Robert Callender International Residency, bring their work together under the title ‘Frag/ment (Terra Non-Firma)’. Kavanagh became interested in the idea of forces straining against one another after seeing how the Japanese try to limit the effects of seismic activity. Beard both makes use of scientific techniques (a ‘self portrait’ in skin oils bonded to a piece of bavarian limestone, for example) and presents pieces of found and salvaged materials which suggest archaeological finds. Whether or not we understand the technical details, the objects themselves are visually powerful, his cement rubble and twisted rebars like the fossils the 21st century will leave behind. Meanwhile, A Human Touch, an open-air exhibition of photography in front of the Scottish Parliament, takes a more direct look at the Anthroposcene. In the tradition of ‘The Earth From the Air’, these stunning images, by a range of photographers from all over the world, are printed on large weatherproof panels. The message is clear: from the capital of the Maldives, dangerously threatened by rising sea levels, to thousands of felled trees in the Brazilian rainforest, the human influence is not doing the world much good. While the lengthy explanatory text - arguably too much to read while standing outdoors on a chilly April day - attempts to offer some balance, the overall effect is to invite us to marvel at the world, then slink away feeling horribly guilty for being here at all. A more nuanced exploration of a very specific aspect of our interaction with the world is explored nearby in Dynamic Earth with Shore: How we see the sea, a project produced by another group of art-science collaborators, Invisible Dust. 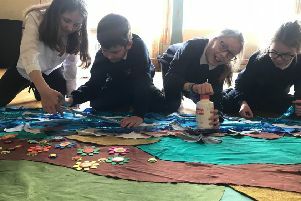 This project, which has been touring in the Highlands and Islands since last summer, commissioned two films to explore the subject of Marine Protected Areas (areas of ocean where fishing is forbidden to help the environment replenish). ‘I walk there every day, but I never saw it that way’ by Ed Webb-Ingall, explores two communities: the islanders on Arran, who campaigned for their local MPA, and the fishermen of nearby Campbeltown, who fish the Arran waters. The film gently opens up the different points of view, addressing the intimate relationship many people have with the sea. Artist Margaret Salmon applies her signature style of lingering, poetic film-making in ‘Cladach’, a portrait of the town of Ullapool, built as a designated fishing community in 1788. The 40-minute film moves from history through the life of the village today and finally into the waters themselves, with some stunning underwater footage. 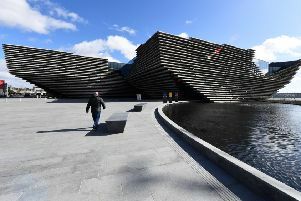 It’s disappointing that visitors to Dynamic Earth will not see Salmon’s film unless they attend special screening events, and the acoustics in the venue make it difficult to hear Webb Ingall’s, which is playing in the show. With such worthwhile work and an important subject, Invisible Dust deserves more suitable conditions to showcase its achievement.